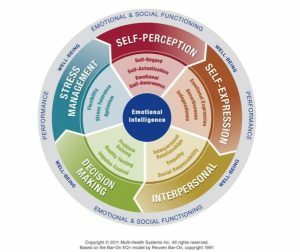 EQ measures emotional intelligence – your ability to sense and effectively apply the power of emotions. 90% of the time the difference between average leaders and superior leaders is attributable to people skills (EQ). This means that at a certain level, you know how to do your job. It’s how you interact with people, handle stress, makes decisions, etc.,that are keys to your success. If you’re not sure you’re as good as you could be, there’s great news. Your IQ peaks at about age 17. Your EQ peaks at about age 40. But, unlike IQ you can keep improving your EQ for as long as you like. First, you need to know where you land now, which you can learn by taking a painless assessment. Here’s a sample of the report generated by the assessment. Look at all the powerful information in your hands! You see that it’s not just about how you get along with people. This graphic depicts the five main areas and 15 “subscales” that are measured. With this information we can pinpoint specific areas you’d like to kick up a notch. For me, it was Impulse Control. My score was lower than ideal, which wasn’t actually a surprise. I could think of several occasions when I wish I could have been calmer and more centered when a certain type of person triggered me. With targeted efforts I made changes and brought that score up. Having a higher number is nice, but more important are the skills I developed that impact every area of my life. I’m a believer that being happy at work is a worthy, even necessary, goal. Being your best self and understanding others has a huge impact on that happiness. This assessment and the work that follows drive long-lasting changes that positively impact you every single day. Your investment of $250 includes private access to the online assessment, a custom 21-page report, and a one-on-one debrief with me, so you understand your results and where to go from here. Contact me with questions or to get started!